If you have never been inside Peterson's Mill retail store, you have never walked into a nostalgic time in North Branch. 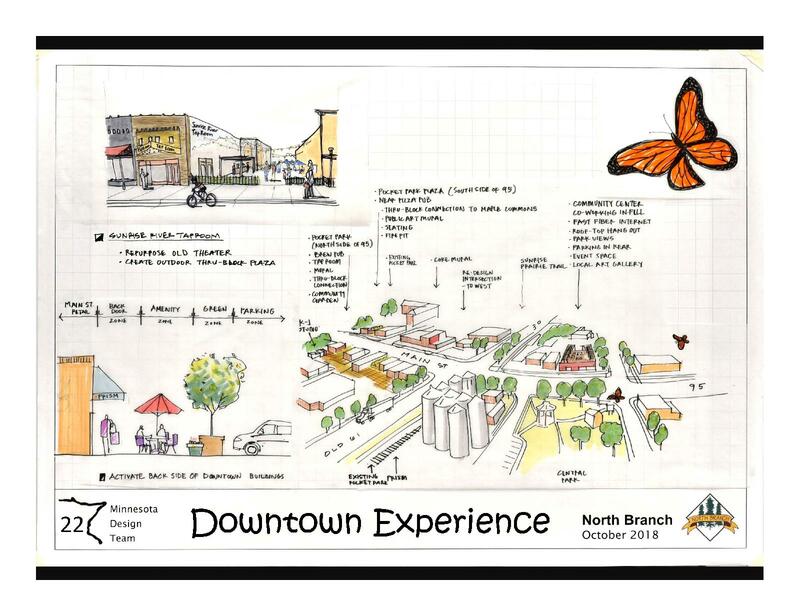 Historically designed showcasing time periods in the retail time in North Branch. Take photos of merchandise for your gardens, animals, yourself. One of a kind items. Inspirational. Fun. No need to worry about reading when you can produce art inspired by the library. With volumes of books, magazines in a beautiful building. We ask to not photograph people without their consent, but otherwise, use the books of our lives and lives past to inspire. Click below for details. The North Branch Police Department is currently accepting applications for a full-time Police Administrative Assistant. This position provides general clerical support to the police department including typing/transcribing officer reports, processing departmental paperwork and records requests, and providing customer assistance to the general public in person, over email, and over the phone. For more information on this position and how to apply, please click here. Applications are due by 4:30 p.m. on Friday, April 19, 2019. 2019 City Of North Branch Advisory Commission Vacancies!!!! Attention Residents!!! You have an opportunity to apply, serve and be part of the change!!! Planning Commission (1 Opening - Expires 2021). This vacancy was created due to the Planning Commissioner being appointed by the Council for the Council vacancy created due to an existing Councilmember being elected as Mayor. Please complete the application and submit to the City of North Branch. Applications accepted until filled. 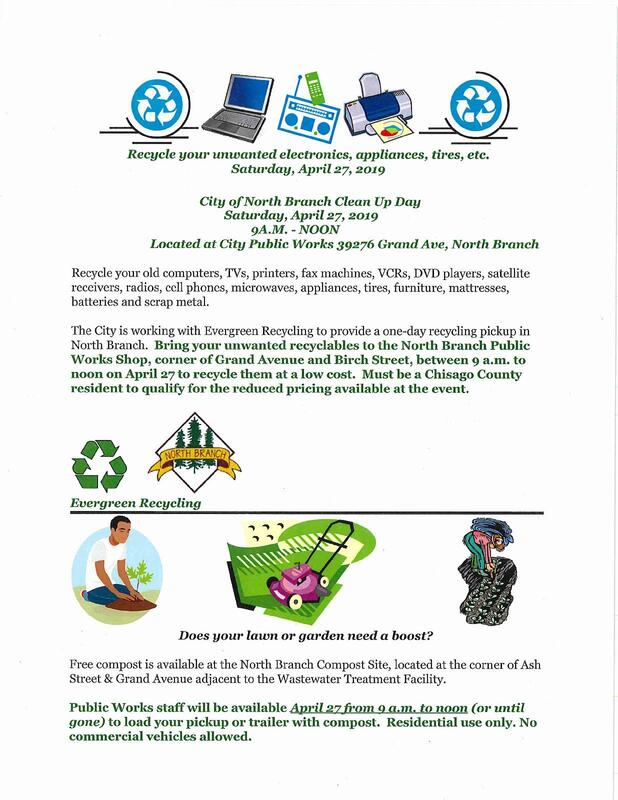 2019 City of North Branch Recycling and Compost Day!!! The City of North Branch, Minnesota will receive sealed bids until 12:00 p.m. April 17, 2019 for the 2019 Garbage Removal Contract. The contract will run from May 1, 2019 to April 30, 2020. Bids to be submitted in a sealed envelope addressed to the City of North Branch, 6408 Elm Street, PO Box 910, North Branch, Minnesota, 55056, and are to be clearly marked on the outside as GARBAGE REMOVAL BID. Bids will be opened and tabulated on April 18, 2019 at 2 p.m. and presented to the City Council for consideration and award at the regular City Council meeting on April 23, 2019 at 7:00 p.m. 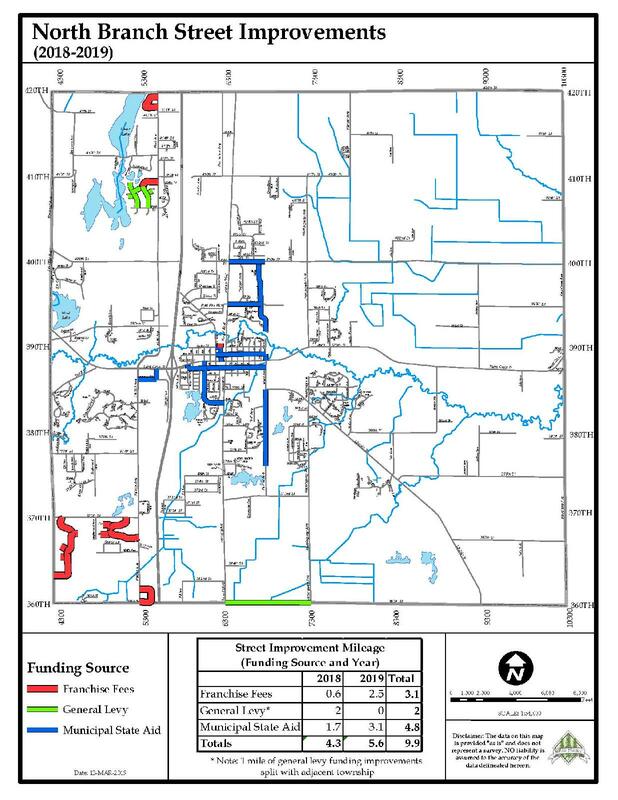 The Board of Appeal and Equalization for the City of North Branch, CHISAGO County, Minnesota, will meet at the Council Chambers located at 6408 Elm Street, North Branch, Minnesota 55056 at 6:00 pm, on Wednesday, April 17th, 2019 for the purpose of reviewing and correcting the assessment of said City of North Branch for the year 2019. The purpose of this meeting is to determine whether property in the jurisdiction has been properly valued and classified by the assessor. If you believe the value of classification of your property is incorrect, please contact your assessor’s office at 313 N. Main St. Room 246, Center City, MN 55012 or call 651-213-8550 to discuss your concerns. If you disagree with the valuation or classification after discussing it with your assessor, you may appear before the local Board of Appeal and Equalization. The board will review your assessments and may make corrections as needed. Generally, you must appeal to the local board before appealing to the county Board of Appeal and Equalization. Residents Of North Branch!!! Job Opportunity!!!! Come help build our community! Implementation meetings resulting from the top initiatives (Arts, Pop-up Parks/Events; Business Promotion; Branding) derived from the Minnesota Design Team visit this past fall have been scheduled.. Please mark your calendars for the following dates! We look forward to seeing you there! Interstate 35 Road Resurfacing project in Chisago County. I’m emailing today to provide nearby communities a project update and to also ask for your assistance on getting the word out about the 2019 construction. An eight-mile section of I-35 between the City of Harris and the Chisago/Pine County line will undergo concrete pavement work beginning April 2019. The project work will also include replacing cable median barriers, installing rumble strips and updating drainage and lighting. The improvements will enhance safety, improve traffic flow and provide a smoother riding surface. I’ve attached an I-35 project fact sheet outlining the work for your convenience. During the construction, I-35 will be restricted to a single lane of traffic in each direction with construction occurring in two stages (see attached fact sheet for anticipated schedule). The Rush City interchange ramp access will be maintained in both directions with two exceptions. In June 2019, crews anticipate a 2-4 week closure to reconstruct the southbound exit and entrance ramps. Additionally, crews anticipate closing the northbound exit and entrance ramps for 2-4 weeks in September 2019 for reconstruction. Detour signage will be posted during the ramp closures. The project is expected to be complete by fall 2019, weather permitting. If you have print or online newsletters and/or a utility bill mailing, please consider including information regarding this construction project. If you need a short article, I’d be glad to assist. Thank you for your cooperation and assistance during this much needed work. 2018 City Of North Branch Winter Parking Restrictions !!! There is No Parking on any City Street from 1:00 a.m. to 7:00 a.m. and City Parking Lots from 2:00 a.m. to 5:00 a.m. from November 1 to April 1. Thank You for your cooperation during this winter season and drive safe. Bridge Road will be closed from Hwy. 95 to 380th Street starting September 4, 2018 for the replacement of the bridge structure. The North Branch Police Department is currently accepting applications for the position of Police Reserve Officer. Police Reserve Officers are non-licensed and non-paid volunteers who are willing to provide volunteer hours at the North Branch Police Department on a regular basis. This position provides for a great opportunity for those considering or currently pursuing a career in law enforcement and for those who are in other careers and wish to serve their community by volunteering. 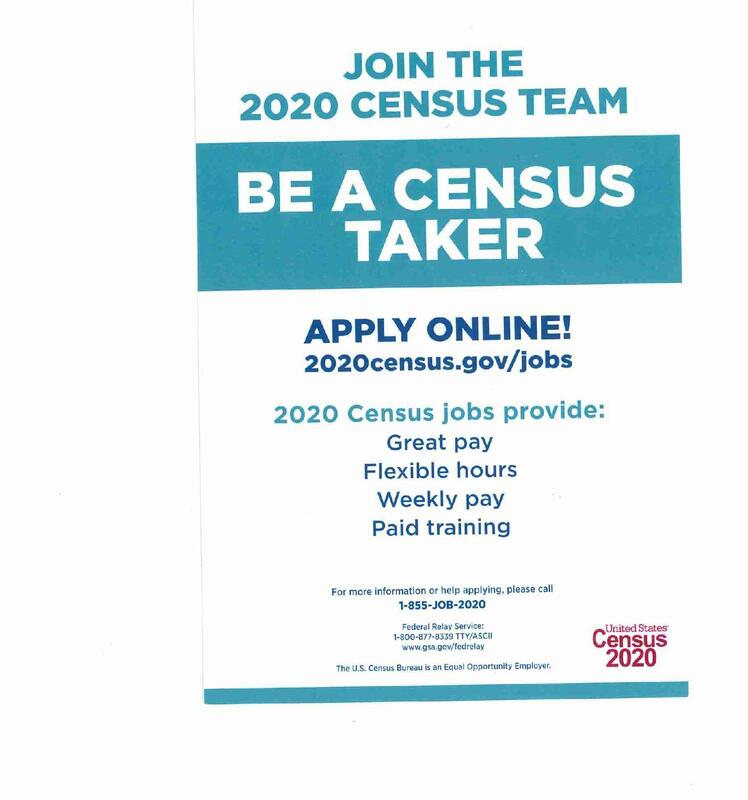 For More information and how to apply, please click here. Useful Tools For City Of North Branch Residents!! League Of Minnesota Cities publishes reports on a yearly basis. 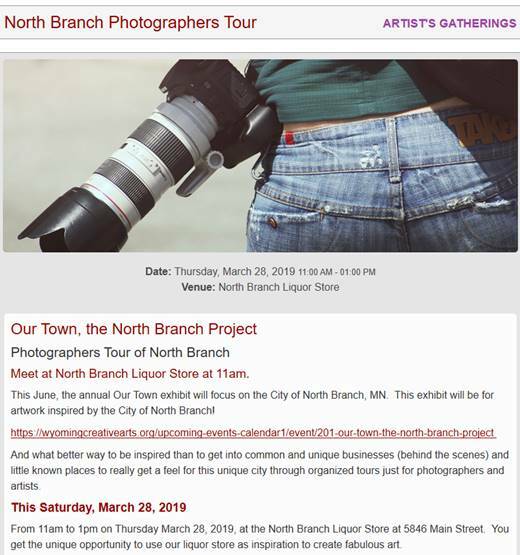 It would be very helpful for residents of North Branch to take a look at these and see where North Branch is in comparison to other cities in Minnesota. 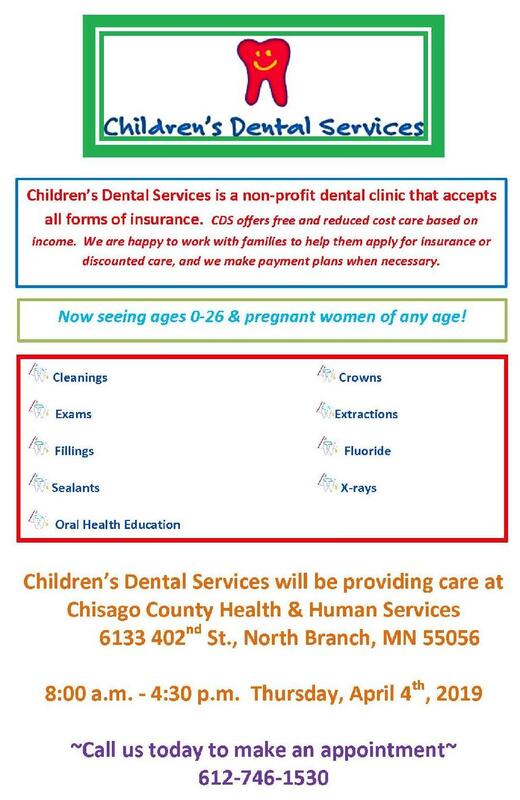 Chisago County Tax Search website.